Over the last few months, we've received a lot of positive feedback about our emails with MCAT success stories and real MCAT Master case studies. "I am 34 years old, changing careers from business/finance to medicine. I went back to school to complete a Post-Bacc Cert and put myself on a pretty brutal schedule in order to get everything done in time to apply for medical school in the 2019 cycle, or about 2 years total. I had a lot of anxiety about the MCAT, knowing that I had to "get it right" the first time in order to keep on track. About a week before the test, I started to panic. I was only getting 502s on the practice exams and the week before the test I was panicking and considering voiding my score..."
To be competitive at my other school choice, Uniformed Services University, I needed a 508, their average admission score. And my practice tests had me freaking out that I could get neither! We know we're always talking about scoring 510+ to be competitive. 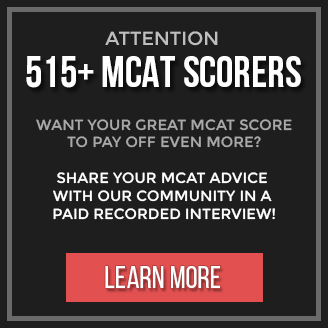 Today we want to acknowledge that for your situation, for your target med-school, a 510+ may not be necessary and that's completely OK.
At the core of it all, we're always pushing for your MCAT "success". MCAT success isn't determined by a score, it's determined by if you get a score that makes you competitive for your first choice med-school. That's all. At the same time, we know if you were to use strategies designed to get you over 510, you'd be competitive for any school, which is why we emphasize that score level. 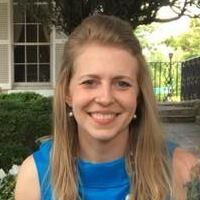 For one, the fact that she had the courage to switch careers and follow her passion into medicine. A decision like that comes with extra pressure to do well. Another major factor is that as an older student nearing your mid-30's, you see the value of 'time' a lot more differently than someone who is in their early 20's. "During that panicked week, I found your site and got the practical exam advice I needed to *understand* the test. One strategy The MCAT Mastery Strategy Guide recommends is reviewing the practice exams and creating a spreadsheet to record what I missed and what I knew well. I used the last 7 days before my scheduled MCAT to exclusively review my past practice exams, and I found that I was consistently missing questions with answers IN the passage, in every section. So my goal for MCAT day was to use every second for each section to find those answers." Knowing the right strategies to take and review your practice exams can be the difference between achieving or surpassing your target MCAT score and being forced to write again. For example like Rachel mentioned, using and creating a spreadsheet for tracking your practice exam performance is extremely useful. Most premeds don’t have a proper system for tracking their mistakes and thus, don’t see steady improvements in their scores. They miss key ingredients and factors that must be noted. In fact, for anyone who downloads the strategy guide, we also give them the MCAT Mastery Mistake Tracker & Analysis Worksheet, which provides you with a perfect ready-to-print template that you can use to track practice exams mistakes, that gets you asking the right questions to identify your weaknesses. Top scorers have found this incredibly valuable to prevent them from making those same mistakes again, which leads to scores increasing with every practice exam. "The guide also mentioned the importance of finding the right strategy that works for you, and I put this to use in CARS. Originally, I had been simply reading the passage, highlighting nothing, and scored 129. I changed my strategy on the last few practice exams and started highlighting like crazy, only to see my score drop to 126. 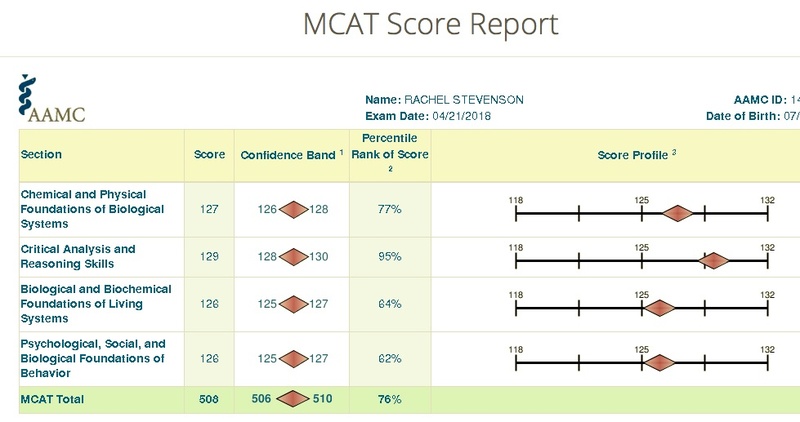 Since the original strategy got the better score, on MCAT day, I went back to simply reading and answering the questions and my score went back up to 129." This is huge. A lot of premeds come across a strategy that's 'supposed' to work, apply it, and start seeing a decline in their scores. Remember, there's a difference between doing the 'right' thing and doing the thing that works. If 99% of MCAT tutors tell you to highlight, but you notice your scores dropping when you highlight, don't force the strategy just because 'everyone's doing it' or because someone with authority said 'you HAVE to do it'. Like Rachel said, we always recommend that you only use the strategies that work for you. At the end of the day, you have your own strengths and weaknesses. You just have to identify what those are. We're happy to give you an entire toolbox of highly effective strategies top scorers have used in our strategy guide, and we highly recommend you try out as many as you can... BUT when you're done trying them out, ONLY keep the ones that give you the best results and throw away the rest! You don't have to use ALL of them. "First, I took about 5 practice exams. Second, I reviewed all of my practice exams and made a spreadsheet showing what I missed/got right and why. Third, I found that I was missing questions that were obviously asking for answers that were located in the passage, so I focused on sleuthing out those answers. This combination was enough to pull my score up from 502 on my practice exams to 508 on my actual exam..."
Firstly, we have a lot of respect for her for following her passion regardless of what many would perceive as 'excuses' and limitations. And lastly, we're super impressed at her ability to strategically pull her score up to her EXACT target score that she wanted in just one week! "For me, my biggest issue was simply maintaining my confidence. During my post-bacc program, I always went class, did my work, and knew I knew enough material. I just seemed to lose my confidence, and for that, MCAT Mastery really helped me feel like I was prepared and helped me feel a lot more confident about my strategies on exam day. The advice in the mastery guide was exactly what I needed to hear in my panicked state. Hearing the basic advice to review my practice exams was gold. I am so glad I googled "MCAT strategies" a week before the test or I very likely would have voided my score and had to retake. The way I see it, I spent $30, but saved $300!" We're extremely thankful to Rachel for sharing her advice and story with the community. "I do really hope that it helps someone else. For me and many of the other post baccalaureate students failure is simply not an option. Thank you guys again for doing all that you do!"